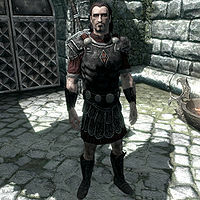 Commander Maro is an Imperial warrior and the leader of the Penitus Oculatus stationed in Skyrim, responsible for the Emperor's security on his visit. His son, Gaius Maro, is also a Penitus Oculatus officer: you will be ordered to kill him in the quest Breaching Security. Commander Maro later destroys the majority of the Dark Brotherhood in retaliation for his son's death, attacking their sanctuary and killing several members in Death Incarnate. It is possible to exact revenge on him in Hail Sithis!. You can find him during this quest on the docks outside Solitude. He will express shock and fear at the fact that you survived his purging of your Sanctuary and immediately attack you to finish the job. Commander Maro wears a set of Penitus Oculatus equipment. This includes the Penitus Oculatus armor, a pair of Penitus Oculatus bracers, and a pair of Penitus Oculatus boots. He is equipped with a steel greatsword. Commander Maro will have a conversation with his son Gaius Maro, regarding his safety before he leaves. Gaius Maro: "Father, you worry too much. I'll be fine." Gaius Maro: "I understand, But you're being paranoid. I'm inspecting security, not charging off into battle. There's not a lot that can go wrong." Gaius Maro: "Farewell, father. I'll return as soon as I'm able." If you talk to Commander Maro when this conversation has finished, he will only say: "Trust me, we have nothing to say to one another." During this quest, Maro will be guarding the door to the Emperor's Tower. If you engage in conversation with him, he will say, "Stop right there. The tower is off limits until further notice." You can now present the Gourmet's writ of passage. He will be skeptical at first, saying, "What's this now?" as he reads the writ: "...order of his eminence... ...possessor of these papers... the "Gourmet"..." He will exclaim, "By Azura. The Gourmet!" If you are wearing chef's clothing, Maro will continue with, "I... I'm sorry! Your clothes... of course... I should have realized! Please, excuse my ignorance. Gianna, the castle chef, has been eagerly awaiting your arrival. You should proceed to the kitchens straight away." If you're wearing any other clothes, he will instead say, "I... I'm sorry! I didn't realize! We... we had no idea who to expect, you understand. You're not dressed as I would have suspected... But please, don't let me keep you. Proceed to the kitchens straight away. Gianna, the castle chef, has been eagerly awaiting your arrival." Either way, Maro will end with, "Gianna will be overjoyed to meet you. She's in the kitchens." If you try to talk to him after this point, he will only say: "Just go right into the tower, then straight ahead to the kitchen. Gianna's expecting you." After you leave the Emperor's Tower in Solitude you will be ambushed by Commander Maro and three Penitus Oculatus Agents. Commander Maro will be clapping as you get near the ambush. He will then tell you: "That man was, by far, the most insufferable decoy the Emperor has ever employed. I'm glad he's dead. Ah, but I'm even happier that you killed him. You, an assassin for the Dark Brotherhood, have just made an attempt on the Emperor's life. Would have succeeded, had it been the real man. Surprised? So was I, when a member of your "Family" came to me with the plan. We worked out a deal, you see. An exchange. I get you, and the Dark Brotherhood gets to continue its existence. But you know what? I've changed my mind. How about this? I kill you, and butcher each and every one of your miserable friends? Your Sanctuary's being put to the sword right now. That's what I think of this "deal." You killed my son! All of you! And now you'll pay the price. Kill him/her. And make sure there's nothing left to bury." Commander Maro and his three Penitus Oculatus Agents will then attack you. You can defeat his three agents, but you can only knock Commander Maro unconscious. Upon seeing you at the docks, he will be very angry and will greet you by saying: "By the gods... you! But it can't be. You're dead. You... Yeaaaahhhh!" He will then initiate combat. Your only option now is to kill him. After a guard has directed you to Maro, you can inform him of Astrid's death. Commander Maro will reply by saying: "The leader of the Dark Brotherhood? You mean Astrid? Dead? And this is no jest? Ha! This is the stroke of good fortune. Long have I watched the Dark Brotherhood's movements... waiting for the time to strike. That time is now! My agents have recently acquired the passphrase to their Sanctuary. It is, "Silence, my brother." Every assassin in that hole must be put down! You, my friend. You've slain their leader. This honor should be yours. Do this, and you will be rewarded most handsomely!" If you talk to him before all of the Dark Brotherhood lies dead, he will say: "We have a chance to destroy the Dark Brotherhood, forever. It's all up to you." When you have defeated all of the Dark Brotherhood members, you can report back to him and he will be overjoyed: "By all I hold holy... Can it be true? Have you actually done it? This is a great day, my friend. You have struck a blow against darkness that will not soon be forgotten! Here, as promised - a most generous reward." You will then get 3,000 gold as a reward for destroying the Dark Brotherhood. Afterwards, he will only have one greeting: "I'll make sure the Emperor himself hears of all you've accomplished. You've made Skyrim a better place." It is possible to provoke Maro so that he attacks you, but even though he is a high-ranking military official, none of the local guards will help him. If not killed during Hail Sithis!, he will stand by the Solitude docks for the remainder of the game. This page was last modified on 26 December 2017, at 01:59.